Outdoor Life, Sports Afield and Field and Stream magazines were staples of my reading while growing up. I could not wait for new issues every month and read each from cover to cover. Every winter, articles and pictures about ice fishing fascinated me. I dreamed of drilling holes through the ice and sitting in a nice warm shanty while catching everything from perch to pike. In middle Georgia, ice fishing does not happen. I knew there was little chance of me ever going up north to try it, but I wanted to. In the winter when Dearing Branch froze over, something that didn’t happen every year, I tried to ice fish, but the ice was never strong enough to hold me. I did manage to stand on the bank over deeper holes and punch a hole in the ice with a stick, no drilling needed for the ice that was seldom an inch thick. 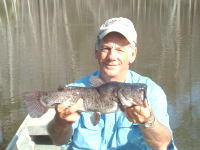 And I never caught a fish, I guess most of our southern fish don’t eat much when it is that cold. I have fished in Wisconsin ten times, but in the fall just after Labor Day. Although I experienced snow and sleet on those early September trips, there was no ice, I was a couple months too early. Signs of the coming ice were everywhere. All docks there are removal, they can be rolled up onto the bank to keep the ice from crushing them. And I was amazed by trees and brush around the bank. There was a clear line about five feet above the water line where no leaves or needles grew. I thought it might be a browse line where deer ate the foliage, but the local fisherman that hosted our group on those trips told me it was the snow line. Snow around Rhinelander, Wisconsin covered the ground and lake ice about that deep for several months each winter, killing the tender parts of the plants. A few years ago, I did catch a fish though the ice. My pond froze over about an inch thick, way too little to support me, but I took an idea from my past. Out on the end of my dock where I fed the fish all summer, I punched a hole in the ice with a pipe, baited up with a piece of floating fish food, and landed a two-inch bream. That will probably be the only ice fish I ever catch. This entry was posted in Fishing Ramblings - My Fishing Blog on January 31, 2019 by ronniegarrison. Dogs have always been an important part of my life. Although I don’t remember my first dog, my parents told me stories of a feist we had when I was two or three years old. That dog would go out in the yard when pecans were falling, bring one to me and crack it with its teeth so I could pick out the meat, according to my parents. Growing up I never had an inside dog. They were yard dogs or hunting dogs, or both. Daddy’s two English setters were not pets, they were hunting dogs and lived in an old chicken house about a mile from our house. Other dogs lived under the porch and lived on table scraps. They had no real job other than sleeping and getting petted every once in a while. Since Linda and I got married we have had six dogs, half of that number now live in our house. All have been “rescue dogs,” one from a shelter, one from the ditch in front of my house, one wandered up at a rental house and one showed up at my farm. One even showed up at a gun club meeting and went home with me. The last one I rescued from a trip to the shelter from a renter that could no longer take care of it. The first three were sources of great joy but also great sadness. Merlin, our first dog rescued from a city pound in Maryland, slept under our bed for 14 years. She went everywhere we went from Canada to Clarks Hill and spent most of the days I went fishing in my boat with me. She was mostly border collie and extremely smart, constantly amazing me with her abilities. Squirt was in the pipe in front of my house one morning when I went out to get the paper. He was so tiny I could hold him in a cupped hand but grew into a 115-pound cross of two breeds, Labrador and big. He was lovable and affectionate but gave lie to the claim all labs are smart. Rip showed up at my farm one day. I tried to run him off but for two weeks he greeted me every time I drove up to the barn with wagging tail and smiling face. Like most labs, he was the happiest dog in the world and everyone seemed to know it. He loved to ride in the back of my truck and went most everywhere around town with me. I seldom came out of the grocery store that someone was not petting him. He just oozed friendliness and happiness. Those three are gone now. Merlin at 14 and Squirt at 13 years old got hip problems and I had to put have them put down when they could no longer stand up. Rip managed to dig out from under the fence around the back yard and got hit by a car when he was ten and had injuries so severe he had to be put down. All three are buried under the pear tree in the back yard. I softened the ground with tears as I dug the graves. Ginger, a pit bull, showed up at a rental house. She had a broken choke collar around her neck and was skin and bones, covered in fleas, and very weak. But she was friendly and wanted affection. I took her home and washed her with flea shampoo then took her to Memorial Drive Vet Clinic where they found she had heart worms. The treatment was expensive but now, five years later, she is healthy and happy. And she proves Pit Bulls are not vicious, even though she had a hard life before I found her. Cinnamon, the other Spice Girl, showed up at a gun club meeting the Monday after I had to have Rip put down. It was almost like fate sent her there. She was young and very friendly and happy. She is some kind of hound with a good nose but all she gets to use it for is finding tennis balls in the leaves. She loves to fetch. Mika is a full blooded, registered border collie. One of my renters had to get rid of him and I agreed to take him. He lives to chase a tennis ball and will jump high in the air to catch it. I think he would run after a ball until he turned into butter! I have had many kinds of pets, from hamsters and flying squirrels to cats and raccoons, but dogs are special. No other animal so closely identifies with people. They seem to adopt our habits and characteristic and some even seem to look like their masters. Dogs are also useful, helping us hunting, working and playing. It is very difficult to hunt quail and raccoons without dogs and they make rabbit and hog hunting much easier. But they are also important for playing, sharing in our fun in many ways. The only problem with dogs is their relatively short life. We almost always outlive our dogs and have to see them age and weaken much faster than we do. But they seem to get a lot out of their relationship with us other than food and shelter. There are many stories of dogs traveling long distances to get back home after being lost. And there are examples of dogs going to their owners graves every day, refusing to accept the fact their human companion is gone. And the videos of dogs re-united with their owners when separated, even for years, are common. There is great joy on both sides when a soldier comes home and sees his dog for the first time after his tour of duty. My three are not old in human years yet, but I still expect to outlive all three, even at my age. I dread the day I again have to dig graves under the pear tree but know it will happen three times. That makes me even more determined to enjoy the time we have together. This entry was posted in Fishing Ramblings - My Fishing Blog on January 23, 2019 by ronniegarrison. Whip Poor Will! That is the sound I heard when I opened my back door just before dark one night last April. It had been a while since I had heard that haunting sound, and it made me remember some past experiences with whippoorwills. Every spring the sound of whippoorwills calling, looking for mates from sundown to full dark, drifts through our woods. I usually heard them at lakes since I spend many spring evenings around them. I always wondered about the birds that made them. One night I got a strong spotlight and went hunting. I was able to follow the sound to a pine tree near my camper at Clark’s Hill and spotted a big brown bird sitting on a limb about half-way up the tree. It was a soft, fuzzy looking bird about the size of a crow, with a short, wide beak. It reminded me of a big quail. When the bird flew, it reminded me of an owl, looking like it silently drifted through the trees as far as I could see it in the almost dark. Although I heard them many times after that, I did not see another one until many years later. While camping at West Point during a spring Spalding County Sportsman Club tournament, a whippoorwill started calling from a pine tree right beside my camp site. The sun had just set and I got a real good look at it. I looked up whippoorwills in my North American Wildlife book when I got home and got a few surprised. It says the bird is 9 to 10 inches long and eats moths and other night flying insects. Its wide mouth helps them catch flying bugs, much like a swallow does. The surprise came when I read the whippoorwills spends daylight hours sleeping in dried leaves on the ground. I always thought it roosted in trees. Now I wonder if I have ever spooked one while walking in the woods, but don’t remember seeing such a bird fly up from the ground. whippoorwills also nest on the ground, laying two eggs in the leaves without making a nest. That reminds me of the way chickens lay eggs. Their range covers the U.S. from the Mississippi River east to the coast and the southern U.S. all the way to California, and also northern Mexico. There is a first cousin, called the Chuck-wills-widow, that also covers most of that southern range. My book says it is very similar to the whippoorwills but its call is slower. That makes sense if it is a southern bird! Listen for whip-poor-wills after the sun sets this spring. Try to track one down if you can. They are very interesting birds, and a part of the evening around here. This entry was posted in Fishing Ramblings - My Fishing Blog on January 21, 2019 by ronniegarrison. Growing up in the 1950s and 60s, fishing was a warm weather sport. We fished from March through August and hunted September through February. I never knew bass would bite in the winter until I joined the Spalding County Sportsman Club in 1974 and fished an October tournament that year and a January tournament the next year. If memory serves me right, we caught a lot of bass at Sinclair. But that was not really a surprise since the weather was still warm. But the January tournament was a big surprise. On a freezing day with sleet, my partner landed a six-pound bass at Jackson, one of six over six pounds weighed in that day. I landed one small keeper largemouth on a chrome Hellbender, one of the few crankbaits we had back then. There were only largemouth in the lake. The days of consistently catching quality largemouth at Jackson are long gone, as tournament results show. In the late 1980s sewage from Atlanta that used to flow into the lake down the South River, keeping it fertilized like a farm pond, was diverted. Even worse, well-intentioned but clueless fishermen midnight stocked spotted bass in the lake. Now they dominate the bass population. Spots grow more slowly than largemouth, don’t get as big, and dominate the habitat since they are more aggressive. Some examples of the changes over the years. I landed my first two eight pounders in January tournaments at Jackson in the 1970s, and the second one was third biggest fish that day. I landed my biggest bass ever, a 9.4 pounder, in a February tournament there. In a March tournament I had fourth biggest fish with a 7.4 pounder. There was one just over eight pounds and a 9.1 pounder. But big fish was a 9.2 pounder. In a tournament with Larry Stubbs, I netted a 7.4 pounder for him then he netted a 7.5 pounder for me! There are many more examples like that. I landed an 8.8 pounder in 2001 in a January tournament, but that is the last fish I can remember over six pounds, and there had been none I can remember for several years before it. If we didn’t have at least one six pounder back then it was a bad day. Spots are fun to catch but totally change a lake. There is no size limit on them anywhere in the state except Lanier, and biologists encourage fishermen to keep a ten fish limit every time they can to eat. I brought home as many as I could after our last tournament. The small ones are easy to filet and taste great. It is unusual to catch one over three pounds and removing as many as possible may help the lake a little. This entry was posted in Bass Fishing, Conservation, Fishing Ramblings - My Fishing Blog on December 15, 2018 by ronniegarrison. Last Saturday 14 members of the Potato Creek Bassmasters fished our November tournament at West Point. We brought 41 bass weighing 58 pounds to the scales. The top four all had limits, but three fishermen didn’t have a keeper. Doug Acree won with a good catch of 13.02 pounds and had big fish with a 5.43 pound largemouth. Frank Anderson was second with 9.17 pounds, Mike Cox placed third with 8.40 pounds and Buddy Laster came in fourth with 7.84 pounds. With all the rain upstream last week I knew the lake would be very different from the one I won on the weekend before. And I was right. The lake had stained up and water was being pulled hard to keep the lake level down. I have had good catches there on rocky points with current rushing past, and I just knew that would work this time. AS we took off at 7:00 AM, fog was starting to form on the lake. Another tournament took off just ahead of us at Pyne Park but I was able to go to my first two places but did not get a bite. I noticed the river upstream of the railroad bridge had thick fog. I went across the very foggy water very carefully to my third stop, watching for other boats and floating logs on the water. Wood was everywhere. At 8:30 I heard a lot of boats running. A big tournament took off from Highland Marina, but it was so foggy in that area they were held until it was safe. At least 40 boats ran past me, headed down the lake. I knew they were going to clearer water. I should have taken the hint but stubbornly kept fishing the heavily stained water. At 9:00 I landed a keeper spot on a crankbait from a rocky point with current so that gave me hope. But at 11:00, without another bite, I realized I had to go to better water. Whitewater Creek was a decent color but after three hours fishing it without a bite, I made a major change, running way down the lake to a fairly clear creek. The last hour of the tournament I caught one keeper, missed two bites where the fish just made a fool of me, and, with five minutes left to fish hooked a keeper that came off as I lifted it over the side. Some days are like that, nothing goes right. I was very weak and tired, so bad that if William Scott had not helped me put my boat in and take it out, I would not have been able to fish. That is my excuse and I am sticking with it! Folks in the club are great like that, very helpful. They are more of the good people you never hear about. This entry was posted in Bass Fishing, Fishing Ramblings - My Fishing Blog, Tournament Fishing on December 13, 2018 by ronniegarrison.